Thanksgiving is upon us, which means Christmas won’t be too far down the road either. It is the season of the turkey feast (or goose, depending on your tradition), so it’s time to review the highly relevant safety tip, don’t feed your dog turkey bones. To be completely honest, it’s not just about the bones. There are other Thanksgiving feast staples that should not be eaten by a dog as they run the range from gastrointestinal irritant to potentially fatal if consumed. You can find some of the biggest offenders below. Bones: Repeat the rule above until it becomes second nature, “do not feed your dog turkey bones”. It’s not always safe for any old man to give a dog a bone, as cooked bones dehydrate and are prone to splintering, which can obstruct a dog’s digestive system or severely lacerate it, causing internal bleeding and potentially death. There’s always a dark side to kids songs, it seems. 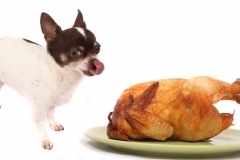 Fat & Skin - Fat, cartilage and skin trimmings are not fit for consumption for dogs as cooked or uncooked they can lead to an onset of pancreatitis. Onion and garlic can cause anemia in a dog, a condition that is caused by the destruction of the red blood cells in their body. A small dose may not too serious damage, but the ingestion of large quantities will indeed act as a potent poison, cutting off the dog’s ability to transport oxygen throughout their bloodstream. Hold the gravy and skip the stuffing, which is usually rife with each ingredient and also often contains raisins/sultanas, another pet poison, which causes kidney failure. Don’t let them get any of the raw potato while dinner is being prepped, these can cause serious digestive upset. Mushrooms can cause acute liver and kidney damage in severe cases but will at least cause pain, nausea, vomiting and increased salivation due to their toxicity. Avocado causes an allergic reaction in dogs to the persin they contain. Persin is a toxin for pets and large amounts are highly dangerous. While not always associated with Thanksgiving, you never know and it’s better to cover the base than let one slip by. The safest way to ensure that your pet doesn’t end up with an upset stomach or worse is to keep them on the same diet as they usually are during feast times. If, however, your dog has a hearty disposition, here is a way to let them join in on the occasion. Add all ingredients to a pot of boiling water and cook until meat is very tender and vegetables are soft. If your pet has ingested any harmful foods, call your local emergency veterinarian immediately. For more suggestions on how to keep your pet safe during fall feast festivities, call your veterinarian today.